I built a diorama, Cuckoo Lane Anglicisation Works, for the 2009 ExpoNG challenge. The theme is a 4mm scale loco works where the OO9 conversion of “unsuitable” N gauge engines is being carried out by the little people. More detail and photos can be found on this earlier blog entry about the model. Although I am rather fond of the diorama I have no real need for it any more, hence the sale. The Minitrix tank loco featured apparently works, although I’ve never tried it. It is 24x24x24cm and would probably be reasonably possible to post although the cost of packaging and sending it is yet to be calculated. Alternatively I could bring it to NG South in April. Offers around £40 (+ postage if required) including the loco. If you’re interested please leave a comment with contact details – I have turned on comment moderation for the time being so your details will not be published. 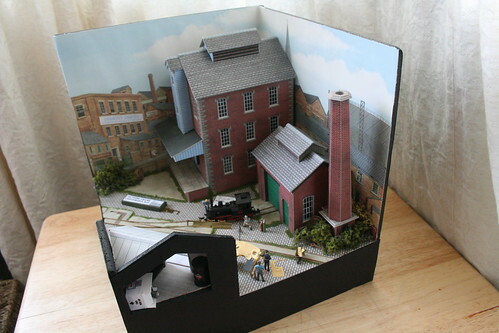 This entry was posted in 009, diorama, for sale, model railways, narrow gauge. Bookmark the permalink.